L'art du jardinage Zen, vous avez l'immense honneur de vous occuper du jardin du maitre ! Mais attention, les maitres du Feng Shui seront là pour vérifier votre travail ! 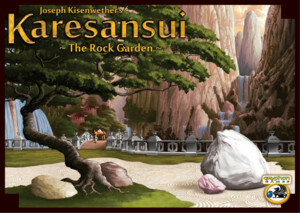 As Grade Two monastery initiates in Karesansui – the cutthroat game of Zen gardening – it will be your great honor to tend the Masters' rock gardens. Each morning the Grade Ones arrive with rocks they've gathered, then haul away the rocks that you don't need anymore – but there aren't enough Grade One initiates to go around, so there will be competition for the best selection of rocks. The Grade Ones will give their new rocks to whoever gives them the fewest old rocks to haul away. Keep in mind while creating your garden, however, that certain combinations of rocks must be avoided! Every afternoon, the Feng Shui Masters come by to check your work. You'll receive demerits for any forbidden combinations – but you'll also receive demerits for your laziness if you don't add new stones each day, so you must find a balance.